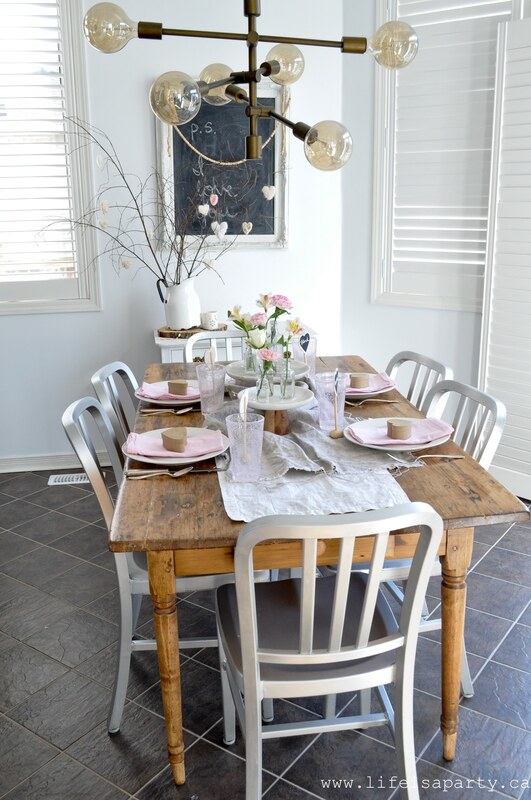 Valentine’s Day Decor -a home tour with simple, neutral, and soft pink decorations for a pretty Valentine’s Day Farmhouse inspired feel. 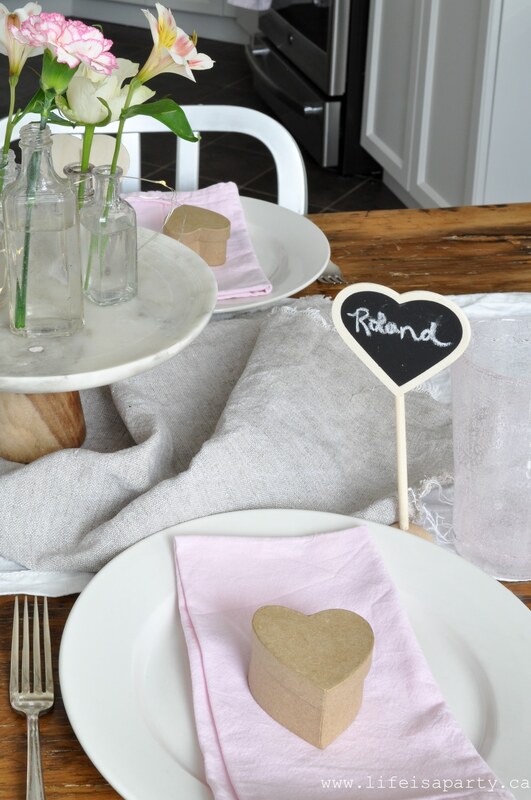 I’ve added a few fun and quite simple Valentine’s Day touches to my decor and I’m excited to show you. I mostly stuck to my usual neutral colour scheme, but I couldn’t resist adding a few pops of soft pink here and there. 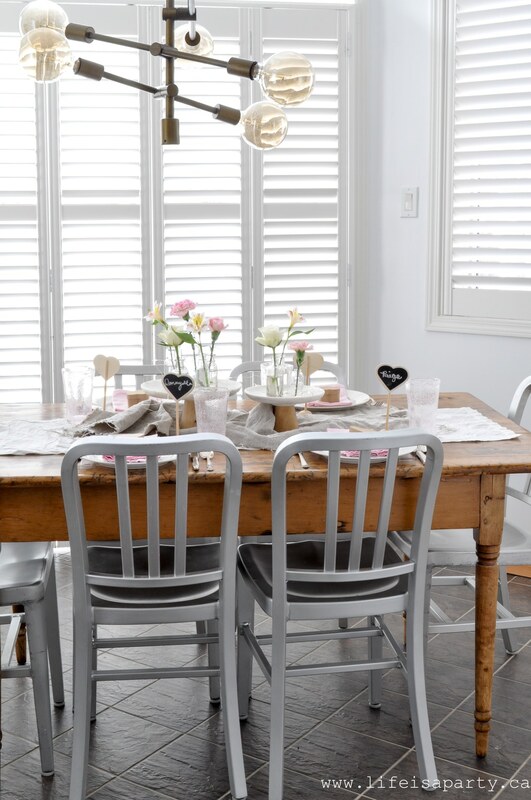 I’m excited to be joining in with some of my favourite Canadian Bloggers to bring you lots of Valentine’s Day inspiration so be sure to check out all the links at the bottom of the post. And, if you’re new here, especially welcome! It really doesn’t take much to make a space feel very Valentines-y, so I hope this inspires you to add a few touches here and there, and celebrate all the love! 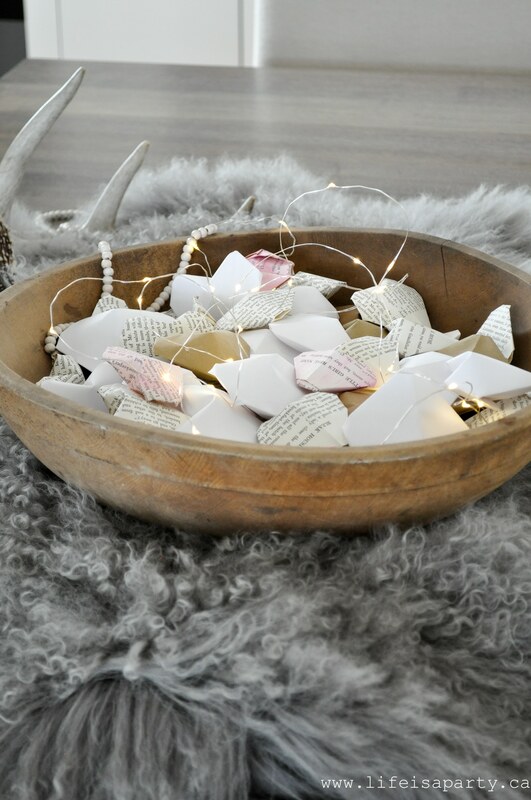 In the dining room, I couldn’t help but use my old favourite wooden bowl full of origami hearts. These hearts are so easy to make -you can watch my 3D origami heart video of the instructions here. I’ve got the bowl on a beautiful grey sheep skin and love the cozy hygge feeling it creates. And over in the living room, I’ve added a little bit of pink. 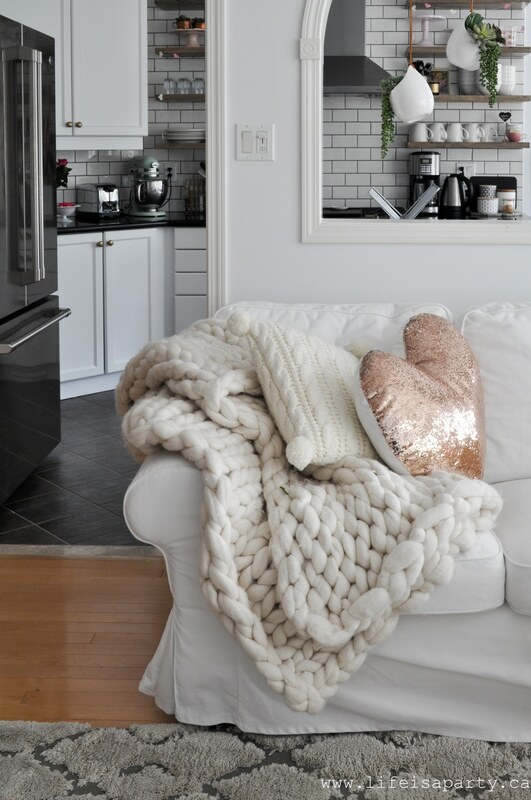 Although I love my white and cozy neutrals, I just can’t resist at least a little light pink this time of year. 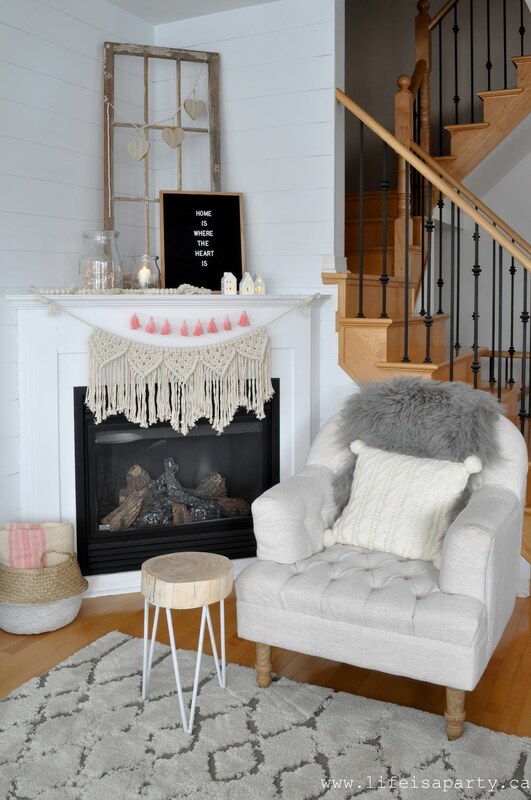 This chair is a favourite of mine -often my desk by day and my cozy tv spot at night. It’s made even more inviting with some pillows. And nothing says Valentine’s Day like some pretty roses -these ones are just from the grocery store, a little treat to myself. The simple heart is the easiest DIY -just some little wooden beads I strung on some wire and shaped into a little heart. Over on the couch, more pretty pillows. But I didn’t start from scratch, I kept all my cozy knit and fur wintry pillow and just added in a pretty peachy pink velvet one and this amazing rose gold sequin heart pillow from Target. The coffee table is like a little tiny stage to dress up for the special occasion. It’s full of tiny treasures and beautiful things. 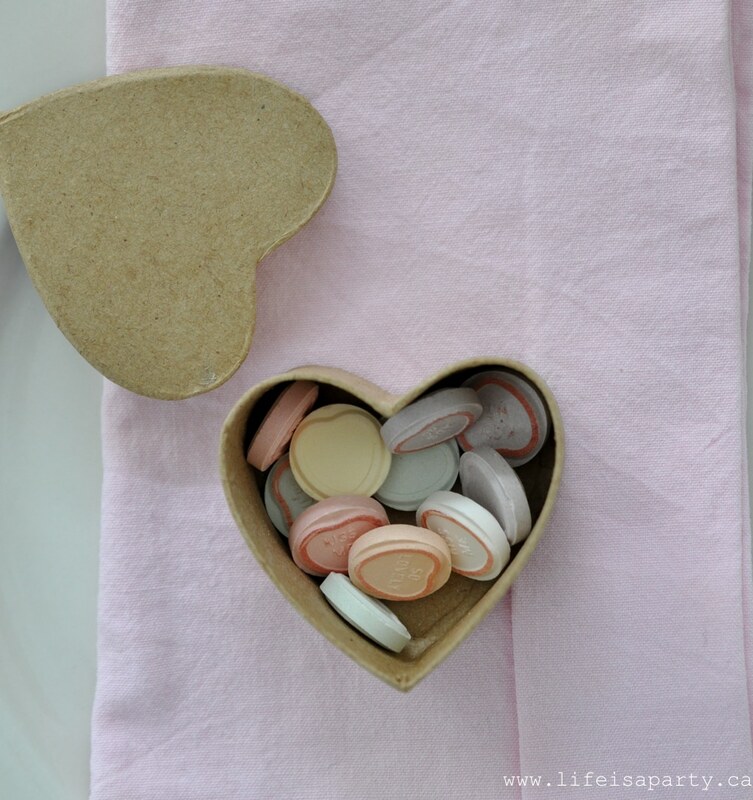 The pretty little wooden heart tray is a Target dollar spot find on a recent cross border shopping trip. So are the sweet heart twinkle lights. 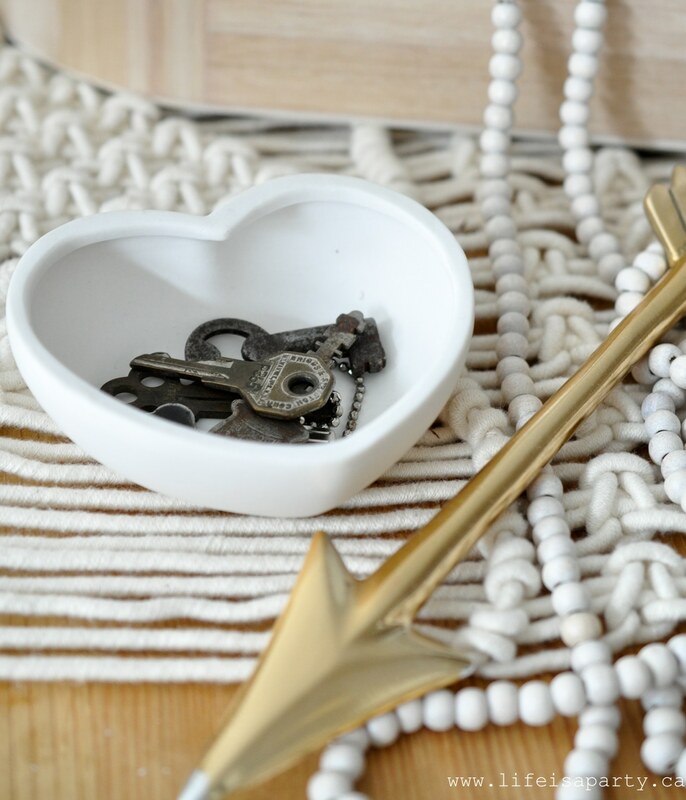 This little matte white ceramic heart bowl holds a collection of old keys. I’ve only been to an auction a few times, but this random collection of old keys was part of group of thing gathered up together with the item I was actually bidding on. Sometimes you discover treasure in the most unlikely and surprising places. Perfect for Valentine’s Day, maybe one is the key to my heart? 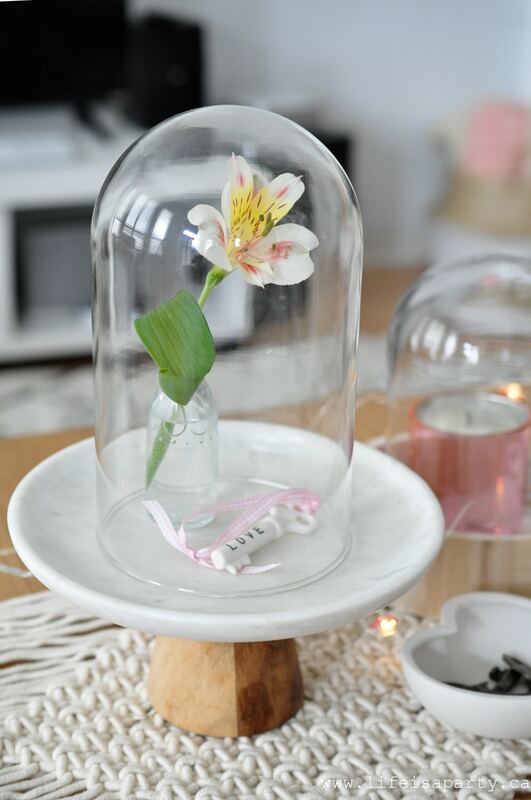 How pretty are the glass cloches? 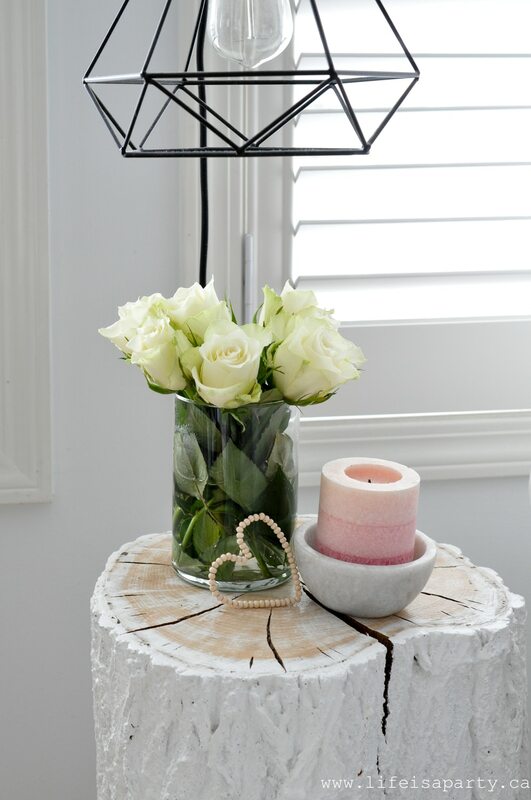 Displaying more simple beautiful things -a flower and a pretty candle. On the other side of the room, the fireplace has a few Valentine’s Day touches. 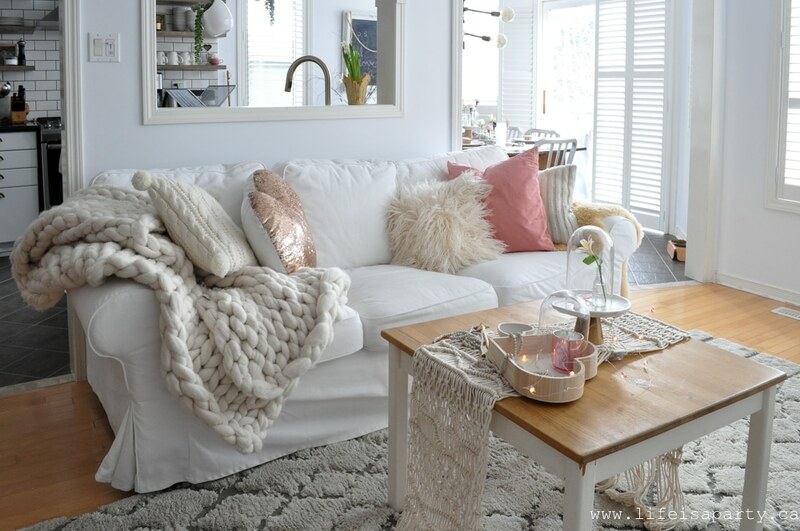 I loved my cozy hygge vibe so much -did you see my tips for hygge living this winter here? All I did was add in some hearts, and bring back the little light up houses from Christmas. After all “home is where the heart is”. 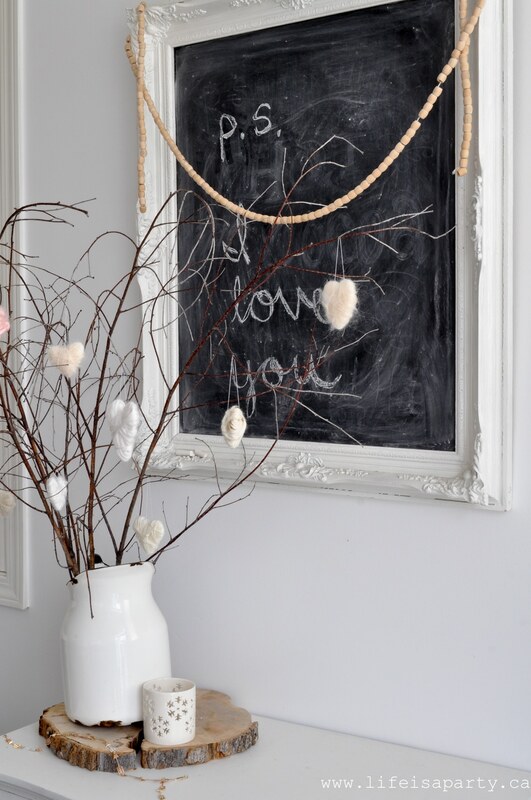 If you’re interested in the macramé bunting or the tassels they’re both DIY projects. The tassel are made from simple cotton string and dip dyed in koolaid -see how I did it here and the macrame bunting is here. I also wanted to add a few touches of Valentine’s Day to the kitchen. 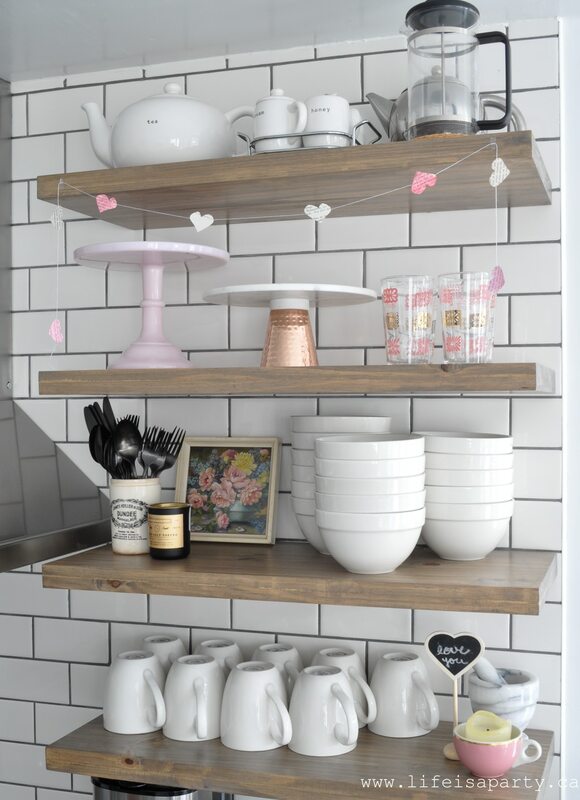 By shopping around my house I found a few pink pieces that I already had tucked away other places and added them to my open shelving. It really doesn’t take much to make it feel like a little love has been sprinkled around. I love all the little pops of pink so much, I will be tempted to leave them out for a long while. The heart garland is made from old book pages cut into hearts, some painted with water colour, and stitched on the sewing machine into a garland. 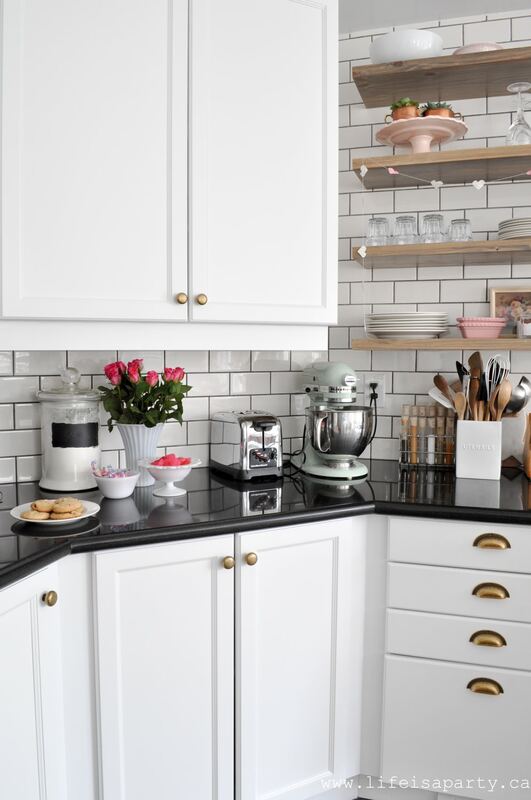 This is my first time adding a little Valentine’s Day decor to the kitchen since the makeover for the One Room Challenge in the fall. It’s so much fun to decorate now. See the big reveal, including some before pictures here. And what a great backdrop the kitchen is now for a pretty tablescape. 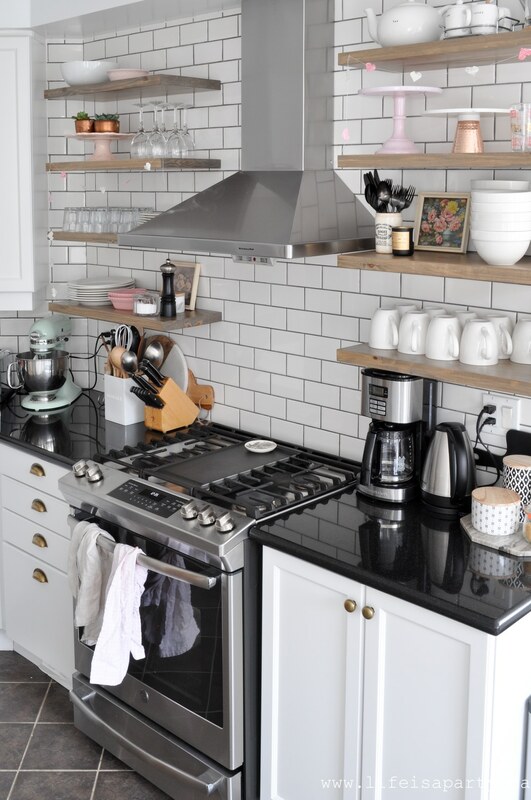 I love the idea of a little cozy kitchen party for just us four -my husband and two little girls, and me. 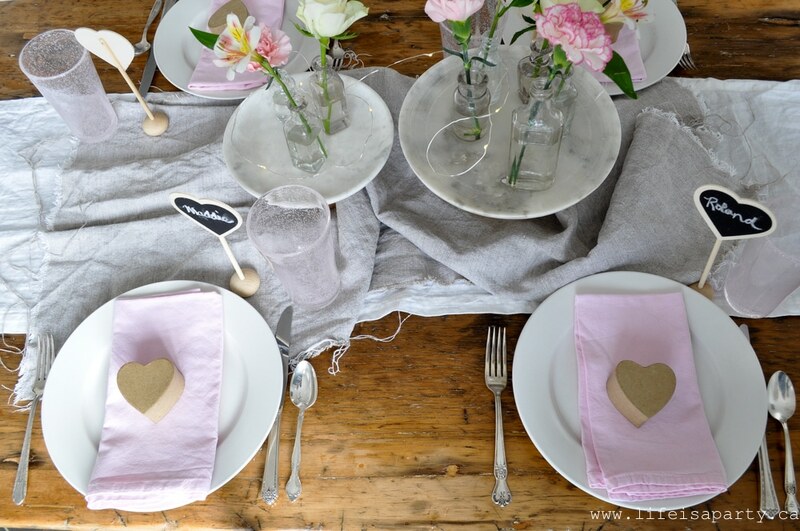 The pretty Valentine’s Day tablescape has lots of favourites collected from all different places, most of which I’ve had for years. I used some linen for a table runner and layered on some marble cake stands and twinkle lights. 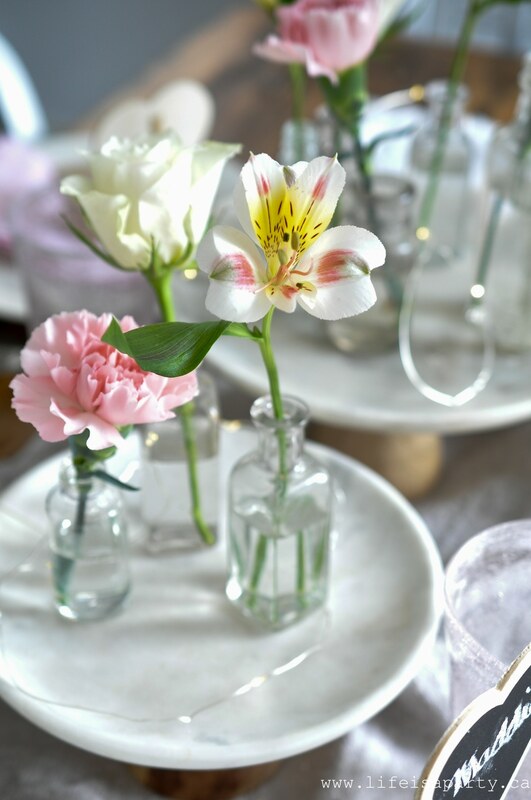 On top of the cake stands I used some little vintage bottles and a few pretty flowers for a simple and so pretty centre piece. Sometimes keeping it simple really is the very best idea. The little heart chalk board place cards are a dollar store find. 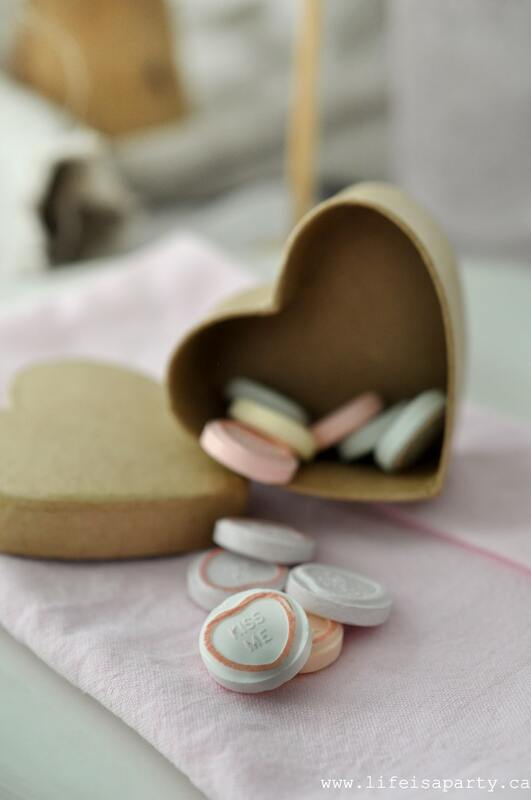 And the little paper heart boxes have a little treat inside. 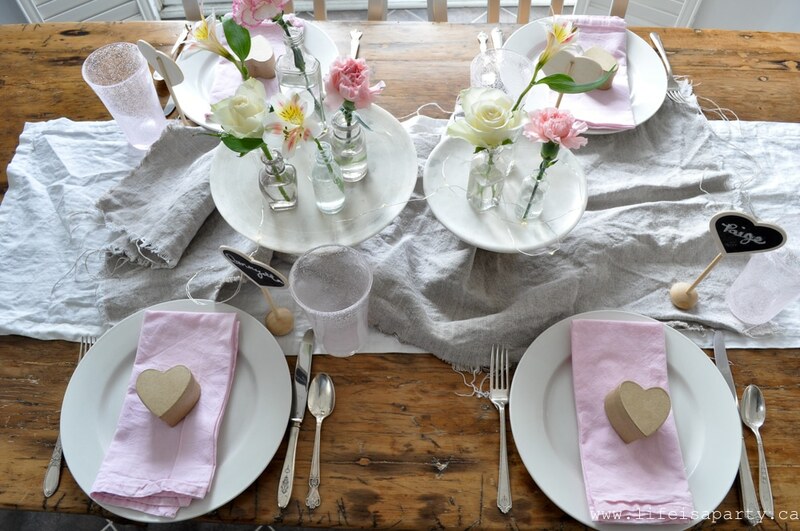 The cutlery on this table is old mismatched silverware from my favourite antique fair. The antique fair is only twice a year; once in the spring and once in the fall so it feels extra special. Perhaps because it’s a bit of a drive away, maybe because it’s only there for one short day twice a year, or maybe even because you have to pay a little to get in I always go ready to buy and I have never come home empty-handed. Some years I have a specific list in mind, other times it’s just what ever I see. At the last one though in the fall, I knew I wanted to pick up some mismatched silverware. There’s a seller who always has it for $1 piece. So I picked out a mismatched set of 6 for myself at the cost of only $18 for a fork, spoon, and knife each. I think this spring I’ll get myself 6 more mismatched place settings and bring up my “set” to 12. There’s something perfectly romantic and Valentine’s Day-ish about this beautiful old tarnished silver on our table. Who knows how many special dinners with loved ones its been used for over the years. And on my little cabinet in the dining area, one more pretty and special Valentine’s addition. P.S. 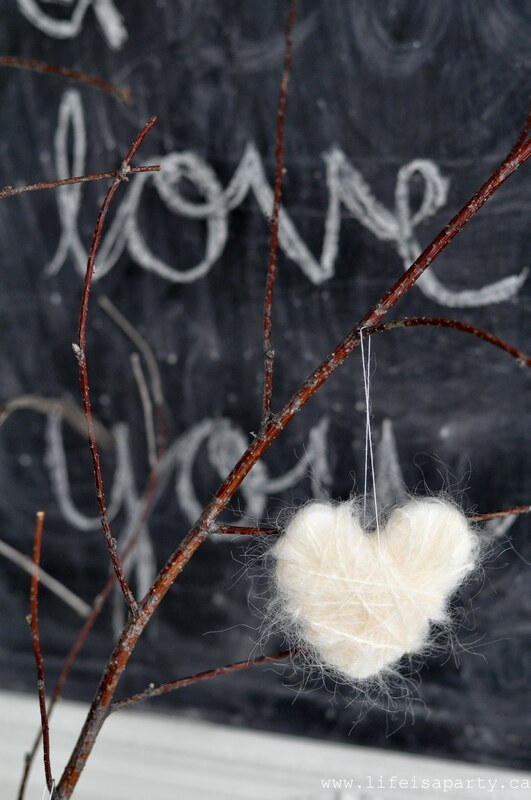 I love you, and the prettiest little yarn hearts. 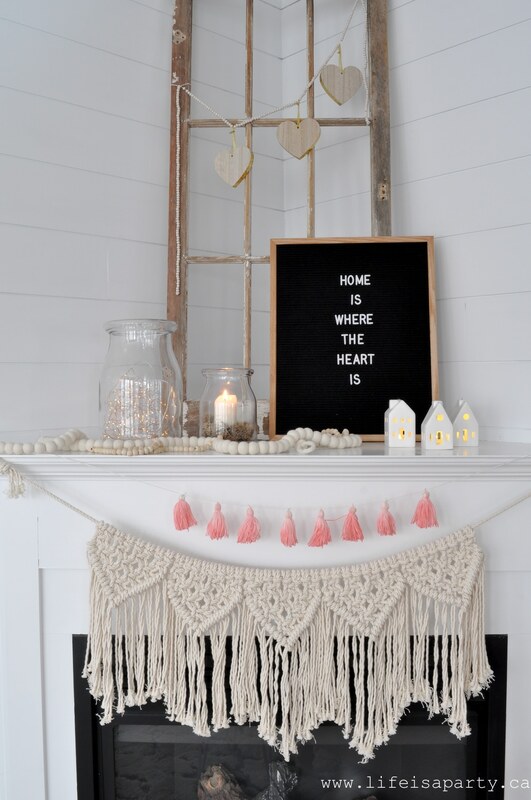 There’s a tutorial on how to make the yarn hearts here -they’re so simple to make and entirely up cycled made from styrofoam meat trays and thrifted yarn. Perfect for kids too. 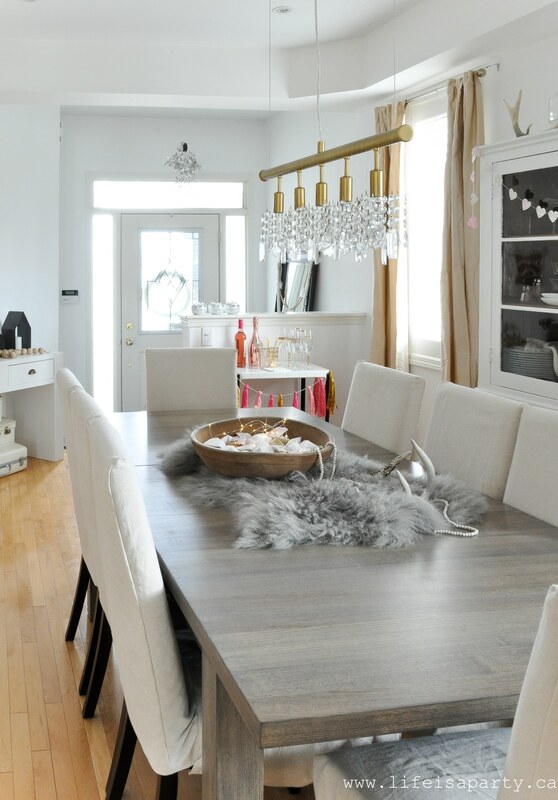 I hope you’ve enjoyed this Simple Valentine’s Day House Tour and that you’re feeling inspired to add a few touches to celebrate the love at your house too. 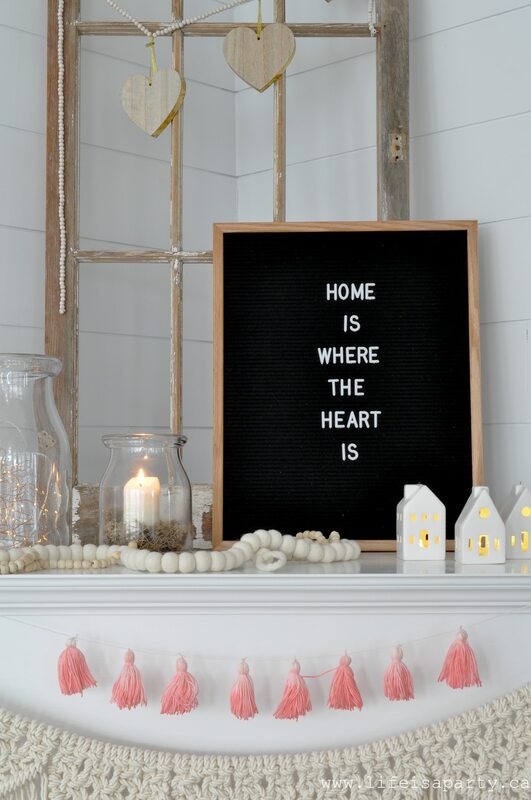 With a house all decorated for Valentine’s Day, life really is a party! 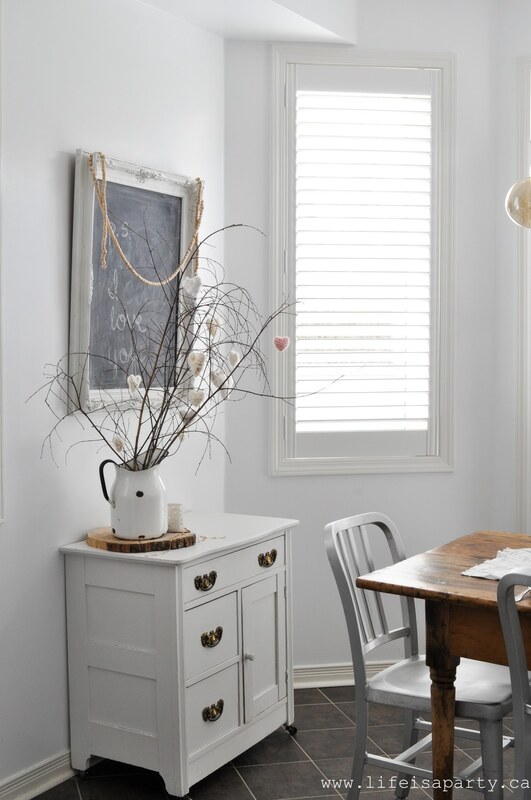 Be sure to check out all the other amazing ideas from some of my favourite Canadian bloggers and a special thanks to Jo-Anna at A Pretty Life for putting his all together. 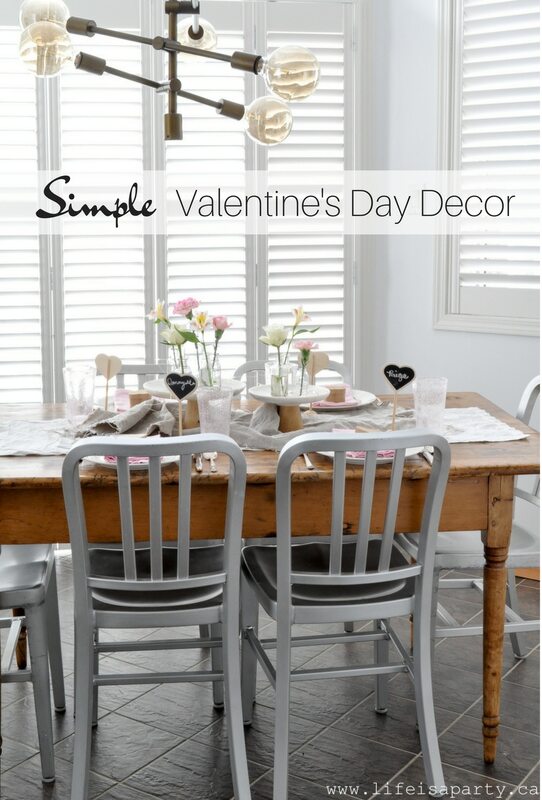 Such GORGEOUS Valentine’s Day decor!! WOW!! Pinned! 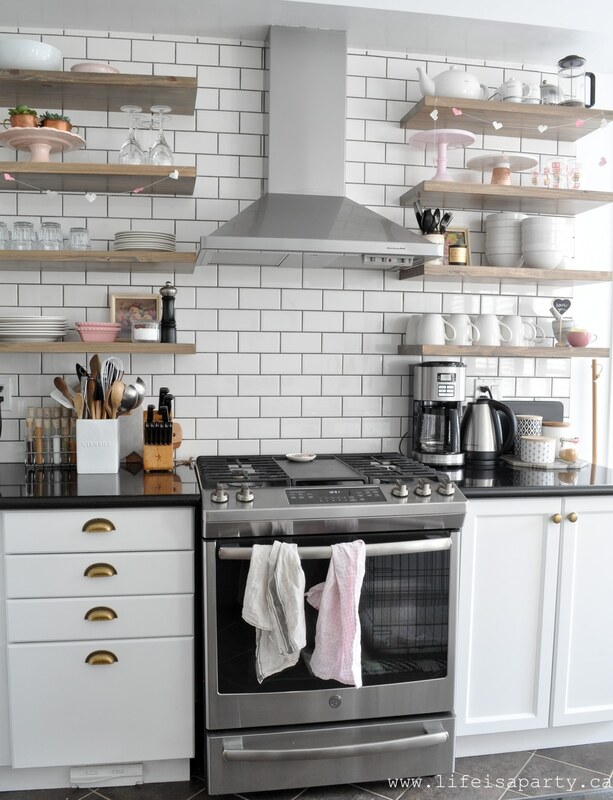 Love all the little splashes of pink everywhere…not overwhelming…just lovely. Totally inspired. My goodness, your home is so inviting!! And your touches of Valentine’s Day are PERFECT!!! 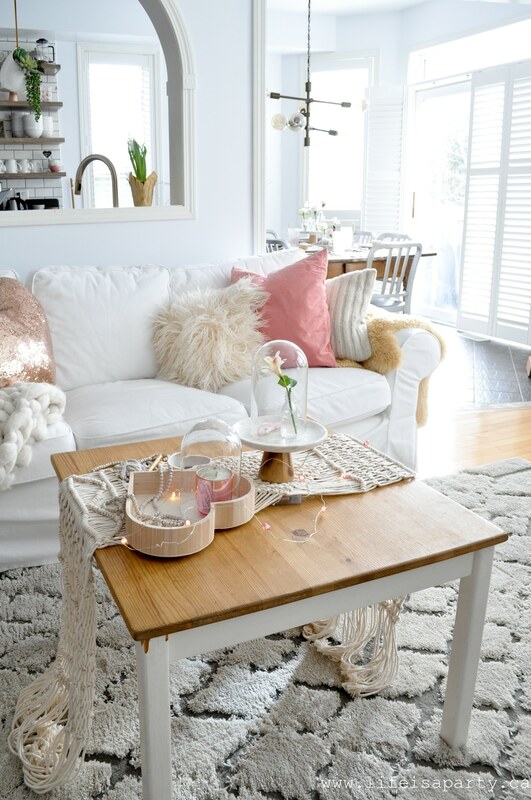 SO pretty Dannyelle…I love all your pretty pink touches around your home. SO cozy and lovely. I LOVE your gingham wall!!!!! What an absolutely beautiful home! And I LOVE the table centerpiece. I love your Valentine’s Day decor. It’s enough to be Valentine’s-y but not over the top crazy. And it all looks so good in your newly white main floor! As always your touches are so beautiful, I just adore that one pink heart on your branches, so sweet! 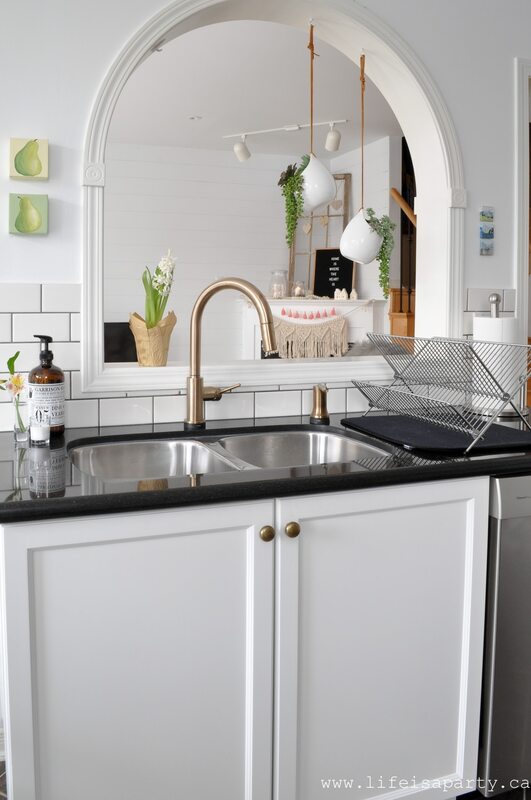 All the different textures in your home decor are stunning. 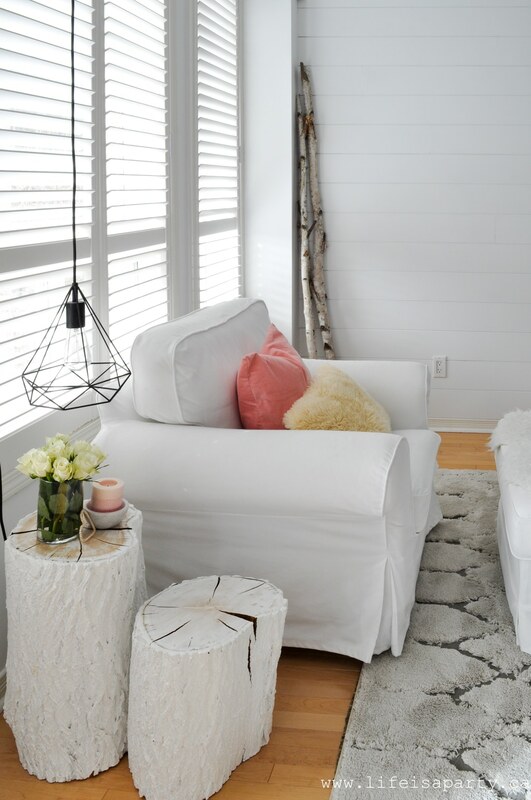 I also love the little pops of pink brought in using the cushions. Very pretty post. Jen, thank you. We could all use a little more pink in our lives, right? Thanks Jo-Anna, bring on all the cozy for February cuddles, right? Adriana, thanks so very much. Leanna, thank you very much. Your home is absolutely stunning!!! So many special, sweet touches Dannyelle! It all looks truly lovely. Enjoy! This is an excellent post you share here. All your valentines day decoration ideas are awesome and unique. 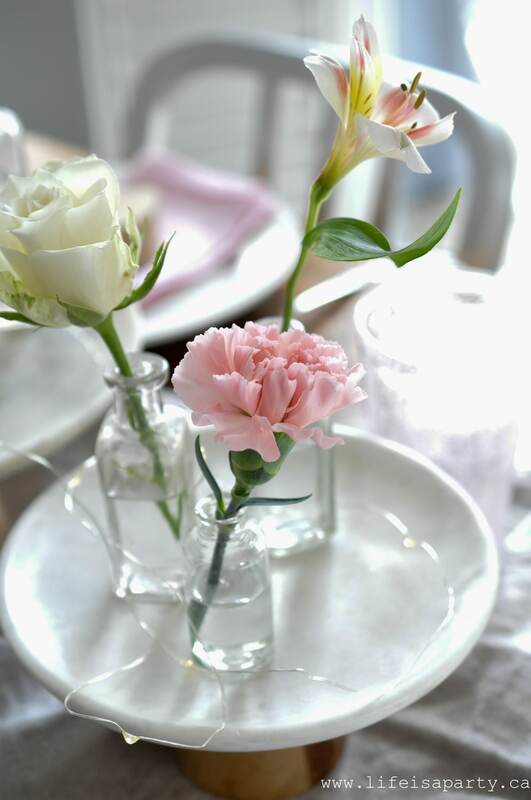 Your decoration process is sweet and simple. I just love all your decorating ideas. Thank you for sharing these ideas. Keep sharing new ideas with us. Oh my goodness, I am in-love with your space, it’s just so beautiful and romantic. And all those little touches for Valentines Day are simply perfection. I love the subtle Valentine’s touches you’ve incorporated! Sonja, thanks so much. Happy Valentine’s Day! Colleen, thanks so much for your sweet comment. I love your Valentine’s Day decor.